District 1 – Tonganoxie has been eliminated, but the other three teams in this district can still qualify for the playoffs. Both games this week will be key and the district points tie-breaker could come into place given the close games thus far in this district. District 2 – Top-ranked Bishop Miege has clinched the district title with wins over Louisburg and Spring Hill. The Stags will be heavily favored against KC Sumner this week. The winner of the Louisburg game at Spring Hill will advance to the playoffs as the district runner-up. District 3 – Eudora has clinched the district championship with wins over Ottawa and De Soto. The winner of the De Soto game at Ottawa will advance to the playoffs as the district runner-up. District 4 – The winner of the Fort Scott and Paola game this week will qualify as the district champion, while the loser advances to the playoffs as the runner-up. The Tigers and Panthers will meet up on Friday in Fort Scott. District 5 – Augusta will host Independence on Friday to determine the both playoff spots in District 5. The winner will qualify as the district champion, while the loser advances to the playoffs as the runner-up. District 6 – Topeka Hayden has clinched the District 6 championship with wins over Andover Central and El Dorado. The Wildcats will be heavily favored against Towanda-Circle this week. The second playoff spot will be determined by the winner El Dorado at Andover Central. District 7 – Three of the four teams are still able to qualify for the playoffs. Ulysses can clinch the district title with a win at Wellington. Should the Crusaders win, they can be district champions if Rose Hill upsets Mulvane. If Mulvane, Wellington, and Ulysses all tie at 2-1, the points system will decide both playoff spots. Rose Hill has been eliminated. District 8 – A year ago this was one of the most competitive and wild districts in the state. This year it’s cut and dry, but there is a huge showdown to be played. Fifth-ranked Abilene travels to No. 2 Buhler this week to decide the district championship. The winner advances to the playoffs as the district champion and completes the unbeaten regular season, while the loser qualifies as the runner-up. District 1 – Nothing has been decided in District 1 as all four teams still have a shot at reaching the postseason. Holton can clinch the district title with a win over Royal Valley, while the Panthers can secure a playoff spot by beating the Wildcats by at least 18 points. Jefferson West can get in by beating Perry-Lecompton and a Holton win over Royal Valley. Perry-Lecompton must beat Jefferson West by at least 18 points and hope Holton beats Royal Valley by at least 18 as well. District 2 – Osawatomie will travel to Santa Fe Trail this week to decide both playoff spots. The winner is the District 2 champion, while the loser will qualify as the runner-up and be on the road in the first round of the playoffs. District 3 – District 3 concluded regular season action on Thursday night resulting in Girard advancing to the playoffs as the district champion and Anderson County as the runner-up. 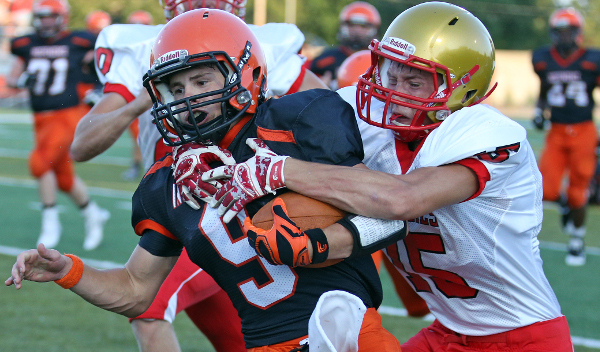 Girard beat Iola 28-14 on Thursday, while Anderson County beat Burlington 34-14. District 4 – Baxter Springs is the only team in this district that has been eliminated. Frontenac and Columbus are heavy favorites to win this week and secure the two playoff spots. District 5 – Andale has clinched the district championship with wins over Wichita Trinity and Clearwater. On Thursday night, Clearwater held off Wichita Trinity 33-31 to earn the runner-up playoff spot. Trinity fell short of the school’s first-ever playoff berth for the second consecutive season. District 6 – Nickerson and Wamego will square off in Wamego to decide the District 6 championship. The winner advances to the playoffs and gets a first-round home game, while the loser of this game is on the road in the first round. District 7 – After beginning the season with five losses, the Colby Eagles have won three straight and have already captured the District 7 championship. Clay Center travels to Concordia this week with the winner advancing to the playoffs as the district runner-up. District 8 – The two GWAC members have clinched the playoffs spots out of District 8. Holcomb will travel to Hugoton to decide the district championship and which of the two rivals gets to host a first-round playoff.